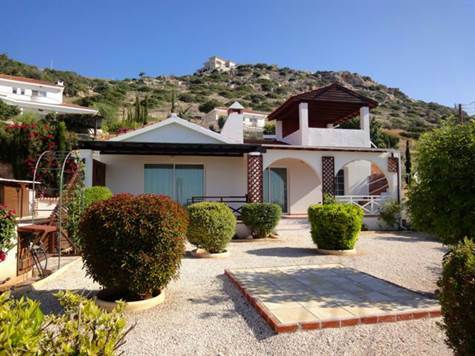 Peyia, Paphos - This charming 3 bedroom bungalow is situated on an elevated private plot in a quiet residential area a few minute’s drive from Peyia village and the popular holiday resort of Coral Bay. The property features an open plan lounge with corner feature fireplace and a spacious dining area. Patio doors provide easy access to a large covered veranda overlooking the beautifully landscaped gardens and the stunning coastal views beyond. Through an attractive archway is a separate kitchen which is well equipped with white fitted units, built-in oven, electric hob and extractor fan, microwave and fridge/freezer. There is easy access directly from here to the outside terrace. A hallway off the living room leads to 3 good size double bedrooms, all with fitted wardrobes. The master bedroom has an en-suite shower room and there is a family size bathroom accessed directly from the hallway. The plot is nicely designed with low maintenance in mind. The wide covered veranda provides a wonderful shaded area and there is also a covered private roof terrace with sensational views and sunsets. There is space in the garden to install a pool if required and a central raised platform is already in situ which is ideal for a jacuzzi/hot tub.